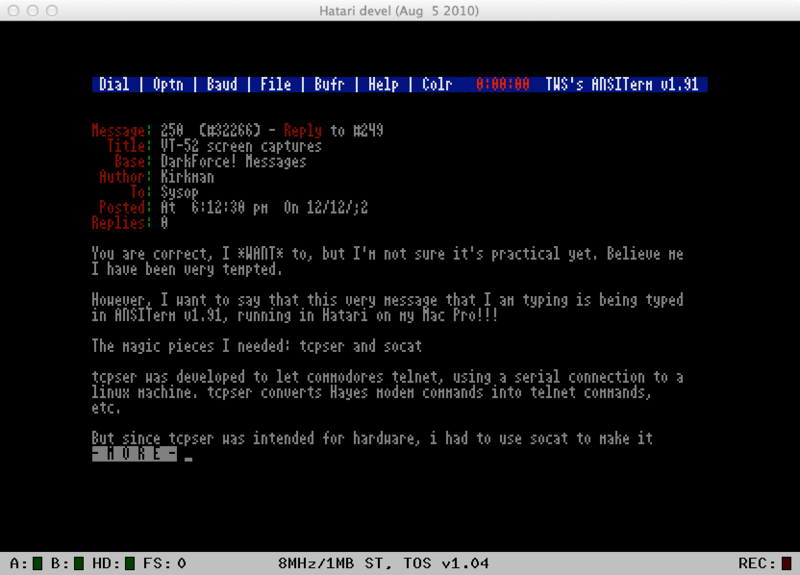 Using the terminal program “ANSITerm” within the “Hatari” Atari ST emulator to write a message on a BBS. I spent much of my teenage life inside the confines of the Atari ST terminal program “ANSITerm” by Timothy Miller of Two World Software. I have mentioned the program before on the blog, and I even described it briefly when I was a guest on the Bobby Blackwolf Show podcast. But I’ve never really given it its due. This entry was posted in Uncategorized and tagged amit patel, ansiterm, atari st, eric march, fansi, reminiscence, solar realms elite, timothy miller on Mar. 12, 2014 .